We built an infographic visualization platform in real time for the 2017 Legislative Elections. We developed the data acquisition system and implemented the design of the client, where the results were published. First we worked on covering the PASO elections nationwide. We developed a system that processed the data released by the National Electoral Comission and published it with an update speed that was highly superior to the competition’s. Finally, we developed an advanced version to cover the General Elections. We finished the initial version in one month. We developed the adaptation for each media in one month. A significant modification between the PASO and the General Elections was the implementation of bench calculations and the grouping of forces. 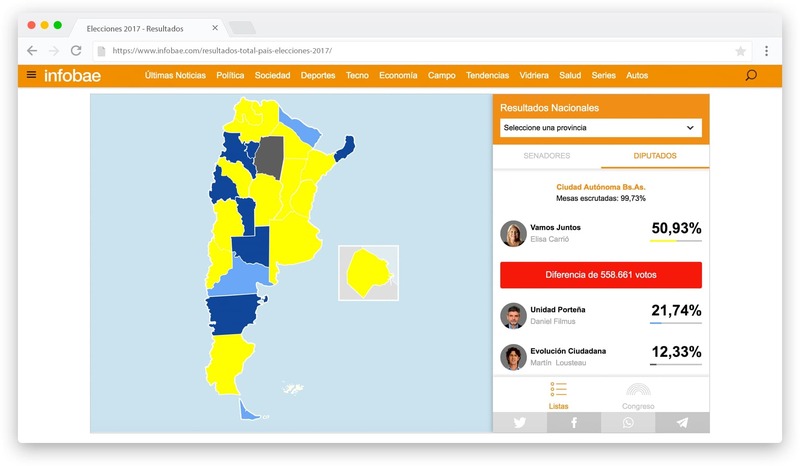 With almost 5.5 million concurring users per minute, we managed to publish the electoral results in real time, in a simple and effective way. During the project, we formed a working team between both companies and collaborated together in the implementation of the product. With and efficient investment in infrastructure, we were able to reduce costs related to the transmission of data and cloud services.